Trolls. Those are the little sh*theads that visit blogs, chat rooms, and message boards just to be ... well, sh*theads. As much as I despise spammers, I think I despise trolls even more. Now, when I say "trolls," I do not mean comments of opposing views. Many blogs accept comments. And bloggers don't always seek positive comments. Opposing views are often welcome at blogs. But there's a difference between voicing opposing views and trolling. If you don't know the difference, you're probably a troll. Trolls don't leave honest, thoughtful comments. Trolls want to take over your post, or even your blog. The term "troll," in case you weren't familiar, comes from the act of trolling, or traveling from place to place looking for something. Like trolling for fish on a lake, or trolling for a hookup at nightclubs. Internet trolls usually go from place to place (Website to Website) making a nuisance of themselves -- mostly because they live in their mom's basement and always strike out when trolling nightclubs. Then, there's the image of the trolls, like in mythology. Or Children's stories. 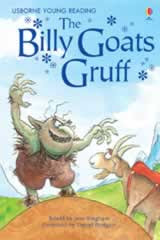 Like the evil little creatures that live under bridges and fight the Three Billy Goats Gruff. That is applicable, too, because of the unpleasant nature of Internet trolls. Conservative blogs get trolls, usually liberals, but not always. Sometimes a conservative who happens to disagree about a certain point (Ron Paul!) will go from conservative blog to conservative blog -- trolling -- leaving comments (Ron Paul 2012!!1!!). Some call it "drive-bys," and while that's accurate, it is trolling at its purest. Sometimes, they'll hang around for a bit, but often, conservative trolls will do drive-bys on conservative blogs. Then, there are the liberal trolls. They will also do the drive-by, or traditional trolling. But often, they'll hit a conservative blog and try to hijack a post. Often, they'll post long missives, hitting all their talking points, usually off the topic of the post. Say, a post is about Obamacare; they'll write 17 paragraphs on Global Warming™ in the comments. And that's the thing about trolls, particularly liberal trolls. They want your stuff. Let me explain. Blogs that have their own domain name? We pay money for those. We also have hosting fees. In other words, we're paying for the existence of the blog. But, we don't have to. For instance, two of the largest blogging services, Blogger and WordPress.com let anyone -- even loudmouth liberals -- start a blog for free. Why is that important? Because if a troll really has a bunch of important stuff to say, he can start his own blog rant to his heart's content. For free. Yes, for free. And, for trolls, that's not enough. They can't be happy with using their own blog -- a blog that costs them nothing. They want to use your Website ... that you paid for ... to spread their message. They want to use your domain name ... that you paid for ... to spread their message. They want to use your Website's bandwidth and disk space ... that you paid for ... to spread their message. Getting something for free isn't enough. They want more than that. They don't just want it for free, they want to take away what's yours. It's the way trolls are. It's the way liberals are. Well, it's been my experience that trolling isn't limited to "liberals" as you imply in your final sentence. I run into trolls that are on the "conservative" side of the spectrum that are equally vile.